STOP! If you have just arrived at this website looking for a top feed drip hydroponics system, you might want to go back to page one of this mini-farm plan. NOW, carry on building this baby! 14. 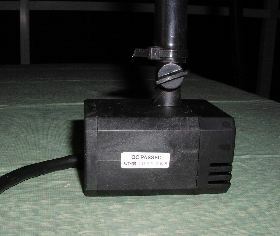 Push one end of the 6 foot ½ inch irrigation tubing onto the outlet port of the pond pump. 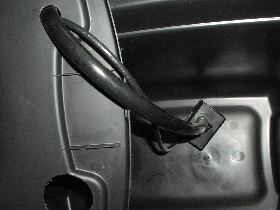 If it fits too loose, you must secure it with a zip tie so it doesn't come off during assembly and operation. First push the pump electrical plug up through the bottom of the reservoir lid, then the ½” irrigation tubing through the same hole. See photos below. 15. 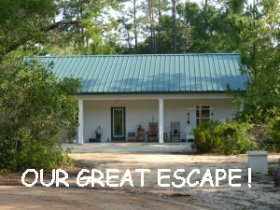 Now set the frame up where you want your garden to reside permanently. Assemble the two black elbow pieces that come with each Bato bucket so it forms a “U”. Then push it forcefully over the drain hole in the bottom of the bucket, until it snaps down completely and the barbs exit the bottom hole. This takes some force. Make sure the barbs go through completely or the bucket will not drain properly. (Can't stress this point too much, took me a while to figure this one out). 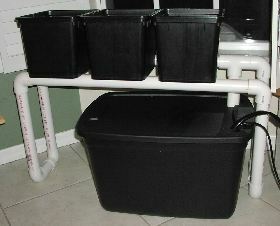 Now put the buckets in place, with the drain elbows extending down into the drain holes you drilled into the PVC pipe. Drip irrigation has long been used in the outdoor landscape, due to its highly effective but water conserving means of keeping even moisture around the plant roots. Top drip hydroponics systems realize high production of crops for the same reason. Nutrients trickled over the surface of the media right at the root zone bathe those roots continually in "grow juice". The result? Amazingly rapid growth with high flowering/fruit production. Due to the recycling and reuse of the nutrients via a drain and reservoir set up, there is virtually no waste of water and nutrients. 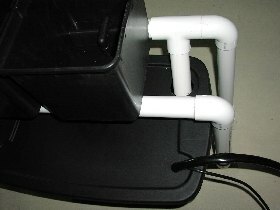 Top feed hydroponics is one of the most popular, prolific and earth friendly methods you could adopt. Get started today with these simple plans.